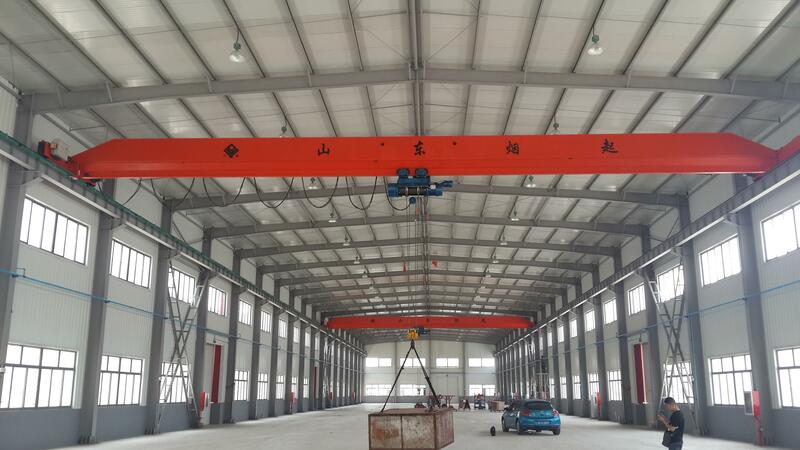 Complying with JB/T1306-2008 standard, LDA electric single-girder crane is widely used in such areas as manufacturing workshops，assembly shops and warehouses. It is not appropriate for lifting molten metal and not allowed in such hazardous environments as flammable，explosive and corrosive. 1. Hoisting mechanism of this crane generally matches with the CD type(single speed)or MD-type(two-speed) electric wire rope hoist .Usually its classification group is M3 or M4 if matching with other type of electric hoist,it can be up toM5～M6. 2.The tavelling mechanism generally matches with YSE motors with soft-start function. Variable frequency motor can be applied for speed adjustment. 3.Equipped with motor grab, the crane can be used to hoist and convey granular materials. 4.This product has two types of manipulation：ground control and cab’s control. The former includes wired button control and remote control, and the latter are divided into two types：open and closed. You can choose one type in accordance with your actual condition. 5.By comparision with the high, this crane with low classification group is flexible，safe and reliable when its lifting load is light and its wheel pressure is low.